SquirrelMail is an open source web-based mail client written in PHP with support for SMTP and IMAP protocol. In this tutorial we’re going to look at how to install SquirrelMail on a Ubuntu 16.04 VPS or dedicated server. In order to follow this tutorial, you need to have either LAMP or LEMP installed on your Ubuntu 16.04 machine. If you haven’t already done so, please check out the following guide. 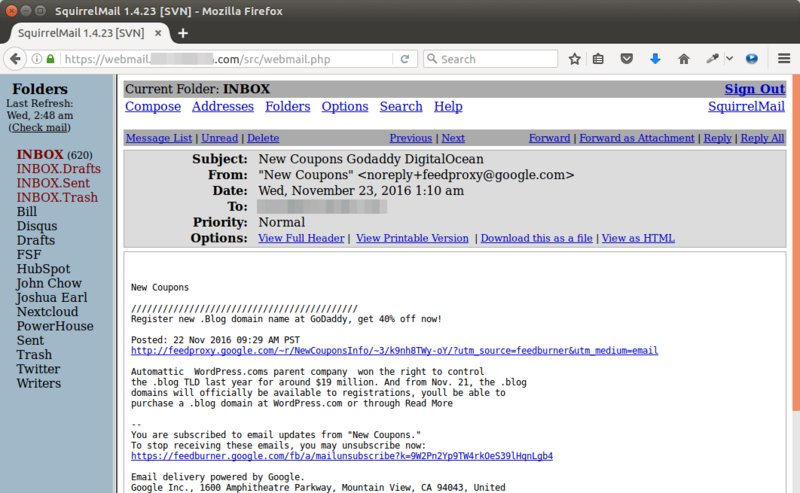 SquirrelMail can be used to access your own email server as well as Gmail, hotmail etc. SSH into your Ubuntu 16.04 machine, update package index and install SquirrelMail, which is included in Ubuntu software repository. /usr/share/squirrelmail/ directory will be the document root. You can use either Apache or Nginx web server. If you are using Apache web server, then copy the example config file (/etc/squirrelmail/apache.conf) to /etc/apache2/sites-available/ directory, at the same time rename it as squirrelmail.conf. Open this file with nano text editor and make some changes. Uncomment the VirtualHost block. Change the IP address to *:80 and replace webmail.example.com with your own domain name. Don’t forget to create an A record in DNS. The above command will create a symbolic link in /etc/apache2/sites-enabled/ directory pointing to the new virtual host file. Now reload Apache web server. Enter your webmail domain name in browser, you should see SquirrelMail login page. If you want to add HTTPS to webmail, then you can obtain a free TLS/SSL certificate from Let’s Encrypt CA. First Let’s install the certbot client. The client is still named letsnecrypt in Ubuntu repository. The following command will install the client and apache plugin. If you are using Nginx web server , then create a virtual host file in /etc/nginx/conf.d/ directory. Put the following text in the file. Replace webmail.example.com with your own domain name and don’t forget to add an A record in DNS. Now you should see SquirrelMail login page in browser. Then use the webroot plugin to obtain the certificate. Replace red text with your actual email address and domain name. You will see the following text indicating that you have successfully obtained a TLS certificate. Your certificate and chain have been saved at /etc/letsencrypt/live/webmail.example.com/ directory. After the certificate is obtained, we need to manually configure TLS/SSL settings. Edit the virtual host file. Change the configuration to the following. SquirreMail configure menu will appear. There are 10 items in the main menu. The 2nd item: Server Settings must be changed in order to make SquirrelMail work. Other items are optional. Type 2 and press Enter to configure server settings. 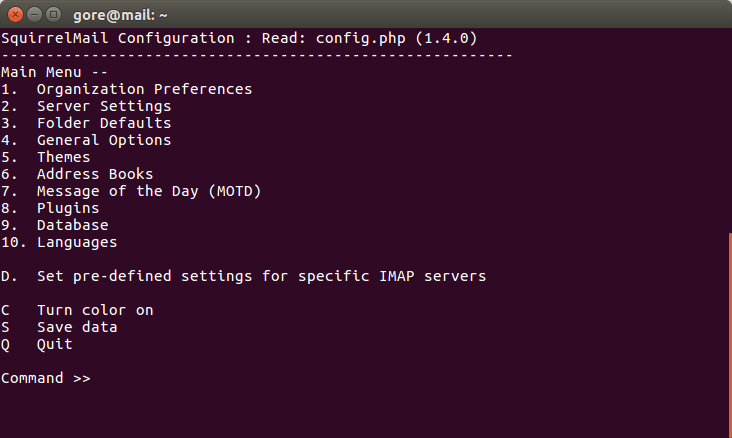 Select 1, A and B to update the domain name, IMAP server settings, SMTP server settings respectively. Once that’s done, press S to save configurations and Q to quit. Now visit the Squirrel login page in your browser and login with your email address and password. 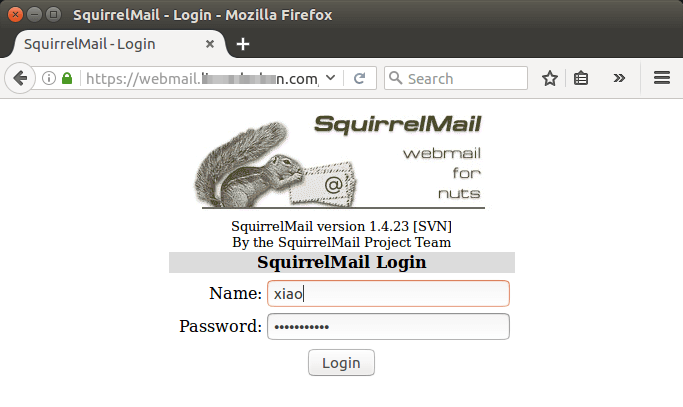 I hope this tutorial helped you install SquirrelMail on Ubuntu 16.04 with LAMP or LEMP. As always, if you found this post useful, then subscribe to our free newsletter.You can also follow us on Google+, Twitter or like our Facebook page.